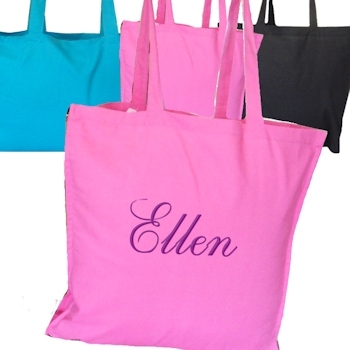 Personalised embroidered cotton tote bag perfect for the beach or weekends away, books or shopping. Each bag measures 30x40cm with a 9cm gusset, the bags are made from 100% cotton and have a flat base and gusset edge for extra holding capacity. Stylish colour in bright pink fabric and personalised with beautiful embroidered text of your choice in the thread colour of your choice too! 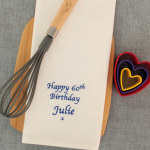 Perhaps a name, nickname, His or Hers, Mr or Mrs, large initials or a little messsage.